The Boomers. (AP Photo/Charlie Neibergall). 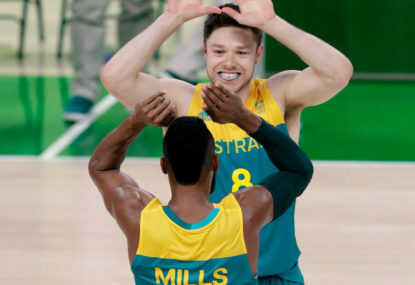 They may have been knocked out of gold medal contention last up against Serbia, but the Australian Boomers still have a wide-open shot at securing their first ever Olympic medal. They take on Spain, who were knocked out by the USA in the semis, in the bronze medal match. Join The Roar for live scores and coverage from 12 midnight (AEST). Australia rampaged through the tournament in stunning fashion, whacking the higher-ranked France, Serbia and Lithuania, among others, while going toe-to-toe with the United States, before losing in the final few minutes. Come the semis, the Aussies faced Serbia again, but couldn’t win when it mattered, going down 87-61 in a match which the Serbs dominated from the opening tip. Serbia have responded in commanding fashion since their patchy pool round performances and will prove a challenge for the US in the gold medal clash. Still, the manner in which the Boomers dominated in the pool rounds should give Australian fans some hope against Spain. At the core of their dominance has been NBA stars Patty Mills, Matthew Dellavedova, Joe Ingles, Aron Baynes and Andrew Bogut. All except Ingles have picked up NBA rings in the past three seasons, and their fast-passing, physical style has underpinned their run through the tournament. The quintet have been crucial for Australia. Indeed, against the US it was only once these five were rotated that the Americans began to claw back control of the game. Spain, led by the San Antonio Spurs’ Pau Gasol, are beginning to hit their straps. After surprise early losses to Croatia and Brazil, the world No.2-team have powered through Nigeria, Lithuania, Argentina and France. They performed well against the US, only going down by eight points. Spain have picked up the silver medal at the previous two Olympics and will be looking to medal again in Gasol’s last Games. Against Serbia, Boomers coach Andrej Lemanis benched Mills, Dellavedova, Ingles, Baynes and Bogut in the final quarter once the match was out of reach, with this game in mind. With Dante Exum, Thon Maker and No.1 draft pick Ben Simmons coming through the ranks, the future is bright for Australian basketball. But what better way to signal to the world that the Boomers mean business than by picking up their first ever Olympic silverware? The first quarter will be crucial for the Boomers, who will have taken a hit to their confidence after the Serbia clash. The Serbs burst out of the blocks to dominate the Aussies early, strangling them for space and disrupting their tournament-best shooting. If the Aussies can head into the first break with their noses in front, they should close out the match by around eight points. Look for Bogut to get physical early against Spain’s big men.